Oceano SRL offers a broad range of products and solutions for the Telco, Energy, Insurance and Financial Services industries. Oceano was born as an advanced technical support company and developed in various areas. Based in Italy, Oceano has offices in Cagliari, Oristano, Milan, Rome, Tirana and Shkodra with a total of over 700 employees/collaborators. Replace Google Apps for Business and Microsoft Outlook email with one, on-premises email platform that provides privacy and security. Security and Privacy: Oceano’s customers were not satisfied with the security and privacy of their email data. The hosted email platform transmitted data via the internet, and Oceano could not block sending to specific domains. Total Cost of Ownership (TCO): Oceano’s costs for licensing and IT maintenance were too high. A high employee turnover rate created an undue burden on their IT Department. Unified Email Platform: Having employees on multiple email platforms was increasingly problematic. Install Zimbra Collaboration Server, a unified email platform to resolve security and privacy concerns and reduce TCO. 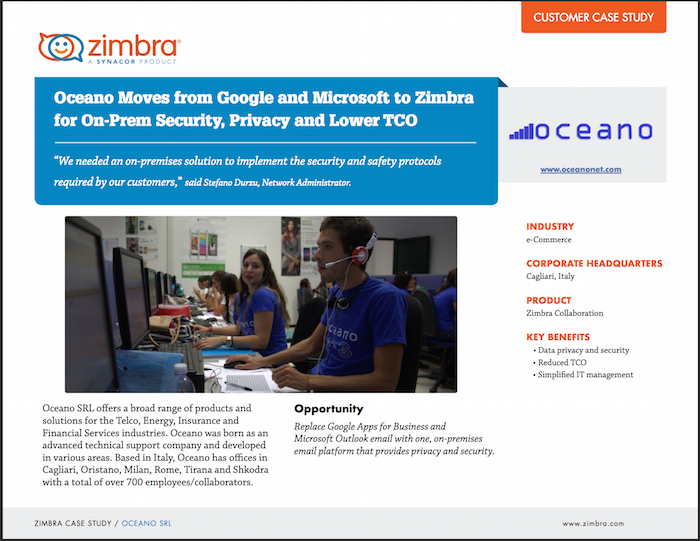 Oceano has deployed Zimbra Collaboration, and they have migrated over 200 Oceano employee mailboxes so far. Employees are enjoying a unified, intuitive Zimbra email experience that offers both conversation view (familiar to former Gmail users) and/or message view (familiar to former Outlook users). How has Oceano addressed their customers’ security and privacy concerns? They customized Zimbra by writing scripts that allow them to specify which users can send to specific domains. “This fulfills the demands of several customers in terms of privacy and protection of sensitive data,” said Stefano Durzo. our customers’ requirements,” said Stefano Durzo. They also want to continue to increase their security measures by implementing mail server blocks, peripheral block of remote terminals, use of electronic badges, whitelisting of websites, etc.